What a week! Bags, family and camera all crammed into the car, off we headed for a weeks break in Cornwall's Looe Bay. 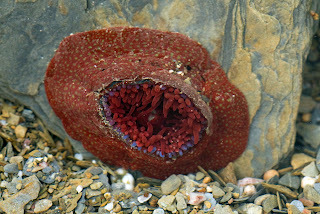 Cornwall has rocky shores in abundance and rocky shores mean.......... rockpools - playground enough for any kid (especially the big ones!!!) 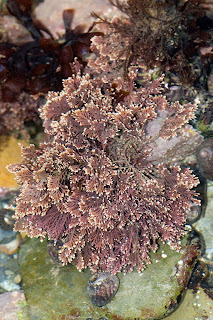 The first location was in fact Polpero, and my mountain goat like eldest daughter soon found a Spiny Starfish languishing in a pool several feet up the side of the rock cliffs. A stunning blue variation it was to. The following day and subsequent days thereafter we stayed closer to home at Millendreath and Looe Bay. 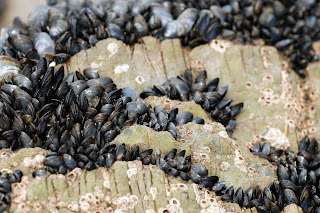 The Mussel and Star Barnacle encrusted rocks were well and truly explored by all of us, remember to be careful if you follow in our footsteps, barnacle shells are sharp, as my not so Mountain Goat like younger daughter found out to her cost! We found an abundance of Rock Gobies and several varieties of Crab, Velvet Swimmers with there flattened rear pair of legs and red eyes, Edible Crabs who have large pincers and hairy legs and of course shore crabs. Common Prawns were seen darting across the pool - a net is a must for catching them. 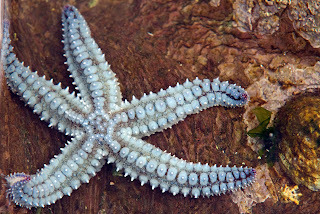 Generally lifting rocks carefully will reveal most of these inhabitants, remember to take care and replace them afterwards as well. 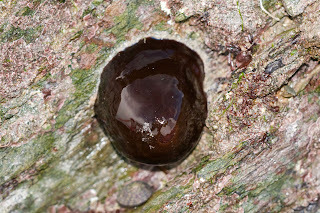 We also came across large amounts of red jelly blobs plastered to the sides of rocks. On closer inspection into the pools we found these to be the jewel in the crown of the day, Sea Anemones! These beautiful creatures are related to Jellyfish. 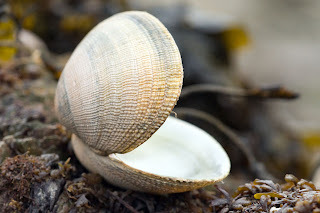 They have a sucker that attaches them to the rocks or sometimes a mollusc. They have stinging tentacles that can even poison small fish. 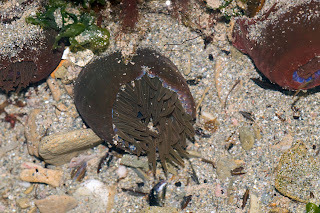 These were Beadlet Anemones, when they are out of water they have he ability to fully retract their tentacles and trap some water to prevent them drying out. They also have, as can be seen 24 bright blue spots at the top of the body. There are 3 forms of Beadlet, Red as above, Green as can be seen above above and the stunning looking Strawberry as seen below. These are truly wonderful creatures and I'm afraid I spent most of my time looking for and photographing them! 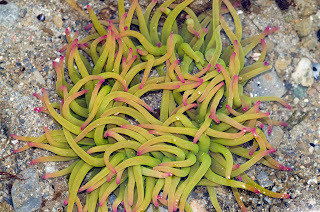 Then during the "hunt" I found an absolute beauty, then another and another, this was the Snakelocks Anemone named by the snaking attitude of it's tentacles, the below is the green variant with purple tips, like the beadlet it has another variant which is a bland green/brown colour. 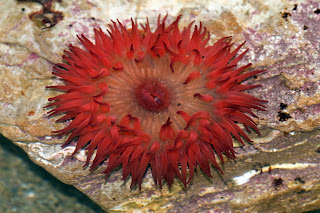 Snakelocks Anemones can be identified by their long tentacles and the fact that they can not fully retract them. Don't let your parents wander off either!